As one of the most economical options for traveling parties both large and small, the vacation rental homes managed by Resort Vacation Properties offer space, privacy and the value of simple pleasures. We have the largest selection of homes on the Island from which to choose and many offer options like a private pool, hot tub, free wireless internet access and open doors to the family pet. Getting away for an anniversary or a honeymoon? Select from several one or two bedroom options or plan a family reunion and bring several generations to a six or seven bedroom home. Thoughtful amenities provided include free long distance calls, plus linens and towels provided in every bedroom - all courtesy of Resort Vacation Properties. It is the little touches that make the difference, so for your convenience, we also furnish a starter supply of paper products, dishwashing soap and bath soap. Resort Vacation Properties understands that every cent counts these days and even more so when planning a vacation. We are now offering significant discounts when you book in advance, and we have a terrific vacation-friendly payment plan. Except for taxes and any optional selections such as pool heat, our rates are all-inclusive so before you reserve someplace else, remember to ask about their extra fees. Our reservations staff is available 24 hours a day, 7 days a week so please call us toll free at 877-352-7935 or visit our website to learn more. 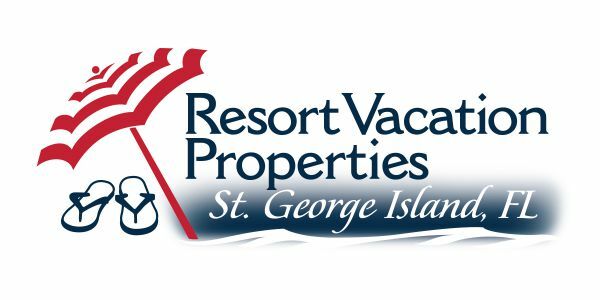 We are the only complete one-stop shop for all your vacation needs while vacationing on St. George Island! Our rentals include Gas powered Golf carts, Bicycles, Kayaks, Stand Up Paddle Boards, Beach Chairs, Fishing Poles and much more. We carry all the supplies you need to hit the beach including towels, sun block, floats, snorkel gear, fishing supplies and more! For the fisherman, we carry a complete line of rods and reels, hooks, lures and bait with Free expert advice and the best fishing spots to visit from our Captains. For the ultimate in fun book a boat trip, we offer pirate trips, sunset cruises, eco tours, air boat rides and more. Professional guide fishing trips are our specialty, we offer both ½ and full days in Apalachicola Bay, Apalachicola River and offshore Enjoy the serene beauty of the Forgotten Coast with a kayak or paddle board excursion, we both rent and offer guided trips. If cooking is not your idea of fun, you’re in luck…we offer private chef services and catering! Jolly Roger Beach Shop is a family owned business started from scratch 10 years ago to give the guests of St. George Island, Florida all the amenities deserved for a great beach vacation. As you can see we really do have everything! Be greeted with a friendly smile and lots of free area advice and information. We truly try harder to earn your business and keep it. Planning a trip to St. George Island, Florida? Stop by and see us on St. George Island. We introduced you to the thrill of fishing Florida's Forgotten Coast, Now we can help you make this coast your home. Tommy Robinson, licensed real estate broker and his wife Kathy, realtor. Cell: 850-653-7196. St. James Villas a community at St. James Bay created to make your golf weekend as comfortable as possible. We have the best fit for your golfing vacation. We also offer brand new luxurious condominiums. Each condo offers breathtaking views of the surrounding golf course. Fully furnished by Tiffin Interiors, all condos offer unique style as well as comfort. Enjoy all the community amenities, covered parking, tennis courts, swimming pools, golf pro shop, picnic pavilions, on-site restaurant and of course all the golf activities you love!